This is about Focus on Energy Residential incentives available to you. We’ll go over modern home assessments and home energy score as well as what homeowners should know about efficiency upgrades. 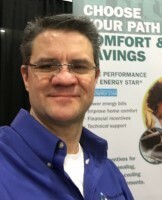 Chad Laibly is the Southwest Regional Manager for the Focus on Energy Whole Home program. He currently manages over 30 Trade Allies, helping them provide incentives to homeowners. Chad is a BPI proctor, modeling software trainer, and business development presenter. In the past 10 years in the industry, he;s audited more than 400 homes, and inspected more than 6,000. Chad holds the following certifications: BPI Proctor, Envelope and Building Analyst, Home Energy Score Trainer, OSHA 10 and Confined Spaces, Owens Corning Certified Energy Expert, and Retrotec Blower Door Certification. Chad is an occasional building science guest on The Larry Meiller show, Channel 57 Talk of the Town, and NBC News. Emily Millar is President of Steady State, LLC, and is a BPI certified energy auditor. Emily was first certified in 2010 in WA, and started Steady State, LLC in 2017. When she’s not poking around attics and geeking out about building science, you can find her enjoying her beautiful farm in southwest WI.